Corri Hopkins (JD ’19) is pursuing a career in business litigation, so she can use the power of strategy and creativity to help those in need. 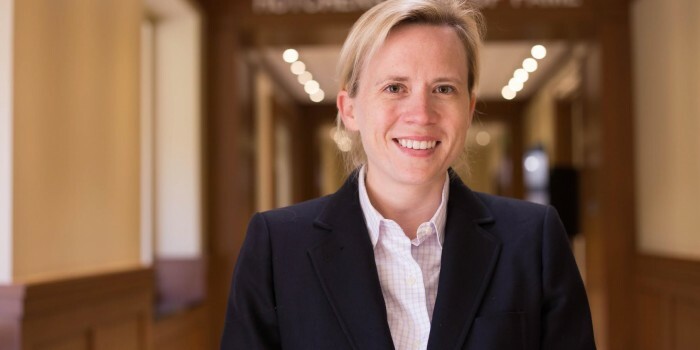 In addition to her service as president of OUTLaw and the Environmental Law Society, Hopkins has supported faculty as a teaching assistant. What did you major/minor in for your undergraduate degree? I had great summer experiences working at three awesome law firms in North Carolina, including Brooks Pierce, Smith Anderson, and Parker Poe. I hope to work in business litigation, because I enjoy opportunities where I can troubleshoot, strategize, and develop creative legal arguments. If I had to describe the Wake Forest community in one word, it would be “welcoming.” The students and faculty at Wake Forest have been so thoughtful and encouraging — they have made my law school experience very fulfilling. My most memorable law school experience so far was representing Wake Forest at the North Carolina Bar Association (NCBA) Annual Meeting. I was lucky enough to be able to accept the NCBA’s 2018 Law Student Pro Bono Award for OUTLaw’s LGBTQ+ Legal Clinic and to explain the importance of legal rights for people who are transgender to 300 attorneys from around the state. What are you involved in outside the classroom (i.e. student organizations, pro bono project, intramural sports, etc.)? Outside the classroom, I have served as president of OUTLaw and the Environmental Law Society. I have also been a member of the “Conversation With” Speaker Series committee and have supported faculty as a teaching assistant and a research assistant. What do you do for fun in Winston-Salem when you aren’t studying? Play with my bulldog, eat Dewey’s cake squares, and visit my grandmother. I am looking forward to practicing law at Parker Poe in Raleigh upon graduation, where I hope to work in the firm’s business litigation practice group and to take advantage of the opportunity to do pro bono work.